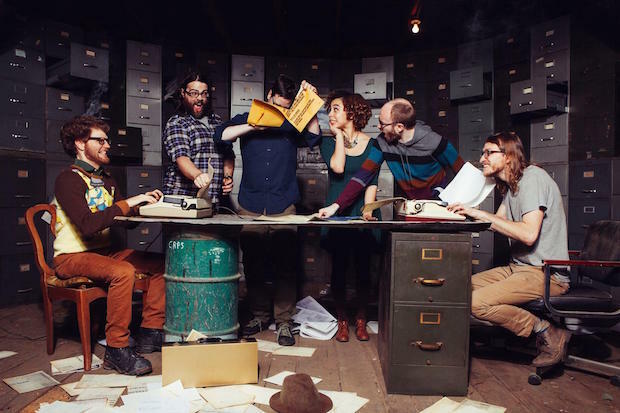 Atlanta based artist collective Little Tybee are back in Music City and ready to share their brand of impressive indie folk/americana big band with you at The Basement this Saturday. Look for electro-popster MYRRA, and old-timey three piece Ploy to kick off a night of eclectic tunage. All this for just $7 at the door?! You’d be off your rocker to miss out on this one, but if you still need more convincing, please read on after the jump for more info on the bill. Equal parts visual artists and musicians, Little Tybee have been on our radar for awhile now. The Atlanta based collective have elements of pop ballad, Americana and indie folk permeating their six-member ensemble, which features wonderful vocal harmonies, violin, keys, versatile percussion, groovy bass, and a very intriguing 8-string guitar. We are big fans of their latest release, For Distant Viewing (2013), and we are looking forward to hearing what tricks they’ve hidden up their sleeve since, like the new track “Tuck My Tails,” which has a music video we’ve embedded below. Their music is definitely for fans of Fleet Foxes, Yellow Ostrich, and Grizzly Bear, so if you like any of those bands, and especially if you like the track below, don’t miss LT’s show Saturday! A transplant from New York, Paul Davidson (aka MYRRA) perfectly blends electro-pop melodies, with unique synths over an alternative indie template to wonderful effect. His debut release, Erase. Rewind. Restart., which dropped earlier this summer, is a spectacular introduction to what he hopes to give listeners in Music City who are searching for more than just your every day pop music. Get to the gig early tomorrow and watch him put it down live, but first enjoy the music video for the track “All About You,” off of his new EP. Harkening back to by-gone area, playing jazz tinged, pop standard styled tunes influenced by the early 20th century, local three-piece Poly have a wide range of instruments to choose from including: violin, cello, melodica, banduria, trumpet, trombone, mandocello, suitcase kick drum, kazoos, upright bass, toy piano, ukulele, glockenspiel, xylophone, bird calls, tiny bongos, sandpaper, stomp box, triangle, ratchet, hi hat, foot tambourine, and other often underestimated or little-known instruments in addition to wonderful three-piece vocal harmonies. You’ll notice guitar is not listed, because guitars aren’t allowed (at least according to their FB page that is). The fun loving band is a sight to see, so get to The Basement on time to experience their unique live show for yourself. Little Tybee, MYRRA, and Poly will perform 08/01/15 at The Basement. The show begins at 9 pm (doors at 8), and tickets are available for $7 at the door.